Would you like to serve up the BEST fries on the planet while having fun and making money at the same time? If the answer was, "Absolutely!" then we'd like to talk to you about owning one of the hottest new franchise opportunities right now. We're looking for entrepreneurs who are salivating at the mouth to own a ridiculously fun, incredibly fulfilling franchise with a growing cult following. 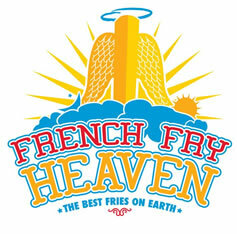 French Fry Heaven is a SNACK ONLY franchise that serves two kinds of fries—Angels and Saints. Angels are classic fries topped with a concoction of the greatest flavors imaginable which represent the favorite flavors from all around the world, ranging from simple Love (Love=Ketchup) to Garlic and Parmesan with Black Truffle Salt. Saints are delicious Sweet Potato fries served either salty, with the Angel toppings or dessert style rolled in cinnamon and brown sugar and covered with things such as caramel, vanilla or marshmallow and pumpkin spice. It's pure heaven! Oh, and keep in mind that we are inventing all the time, so while the typical FFH has its unique menu of 30+ flavors, there are already 50+ available! Why Choose French Fry Heaven? So what makes French Fry Heaven such a great thing to own? Everybody loves fries! 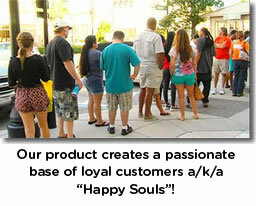 You will enjoy an irrationally passionate fan base of "Happy Souls" a/k/a loyal customers! And since we are a family-friendly business, our products are appealing to anyone who is hungry! Foot traffic is one of the key ingredients to success, and because of our small size and because we don't give off the stink or the mess you might expect from a fry place we are pretty much welcome anywhere. Our first location is situated next to Tiffany's, Louis Vuitton, Coach, Michael Kors, MAC and BCBG, so we are welcome in virtually any environment. Targeted locations include casinos, colleges, bar areas, stadiums, airports, boardwalks, walking tours, military bases, box stores, major activity centers, walking spaces, theme parks, mobile locations, shopping malls, hospitals...and the list goes on. If you can dream it, we can probably make it happen. From the very first day a French Fry Heaven draws massive public relations opportunities. 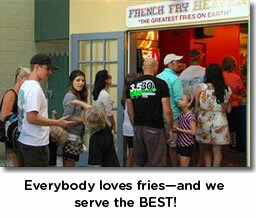 One newspaper speculated that our first French Fry Heaven generated $2,000,000 in free PR in the first few months alone! What else can you get into that will cause that kind of buzz? Our social media presence is as hot as they come and has seen a 60% activity rate, which is unheard of! 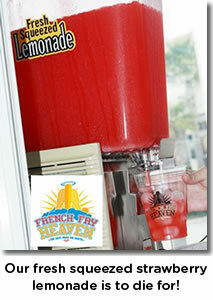 Heck the French Fry Heaven name and other naming conventions generate virtually unlimited marketing opportunities. Our series of cartoons that are attached to our flavors open endless possibilities for promotion. Ultimately the coolest thing about FFH is that people are irrationally passionate about our product and generate the buzz at a level others only dream of! French Fry Heaven is looking for franchisees who want to make a change in the snack world forever. Ideal candidate is someone who enjoys to smile and make others do the same. Management, sales, and a great connection to your market will help you become a perfect franchisee. No previous restaurant experience is necessary to own a French Fry Heaven franchise. We provide a comprehensive training program prior to opening and there are ongoing training systems in place to support our franchisees' success. Contact us today to see why we are the hottest new franchise opportunity around! 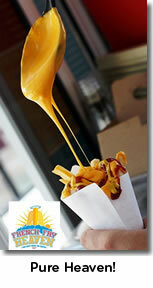 Click on Request Information button above for FREE information on how to start a French Fry Heaven franchise today! Please Note: French Fry Heaven opportunities for sale, and other franchise opportunities, business opportunities, businesses and franchises for sale on this web site are not to be considered as an "offering", "franchise offering", suggestion or recommendation by GlobalBX. The franchises, businesses and business brokers seen on this web site submit their own individual content. This advertisement depends entirely on the truthfulness of the information provided by our advertisers which includes, but is not limited to, franchisers, franchises, franchise brokers, franchise consultants, business sellers and business brokers. As always, GlobalBX recommends that you consult a lawyer, financial consultant, accountant or professional advisor before buying a franchise or business opportunity or any type of business. By submitting this form and requesting more information, you have agreed to all terms and policies of GlobalBX and the business and franchise offerings listed here. Please review our Terms & Conditions for more information.